This 17-piece ensemble will swing you right out of your seat. GROOVE’S MOOD is a blues inspired by Frank Foster’s feel good composition, “Hip Shakin’” and the toe-tapping groove of Art Blakey’s shuffle (Moanin’, Blues March, etc.). BRASILIA is a medium tempo samba named after the capitol of Brasil. I had the pleasure of touring that country years ago and the feel of it stayed with me. YOU ARE THE SUNSHINE OF MY LIFE is a Stevie Wonder classic. This arrangement was inspired by recordings of this tune done by Stevie Wonder, Cold Blood (Tom Harrell’s arrangement) and Grover Washington (Bob James’ arrangement). This version features Ms. LaTanya Hall on as our guest vocalist. THE SOULFUL MISTER TIMMONS is a James Williams composition taken from the Art Blakey songbook. Anyone who had the pleasure of meeting James would agree that he was one of the kindest, supportive people around. His passing left a hole in the jazz community. Hopefully you’ll get a small group feel from this big band arrangement. SKYDIVE is a Freddie Hubbard composition. I never get tired of listening to Freddie. He’s written more compositions than I can name that I’d love to do as big band arrangements. This is just one of many to come. Jamestown, Virginia was the first successful permanent English settlement in British North America founded in May 1607. In late August of 1619 a Dutch ship traded the settlers twenty Africans for food and supplies. They’d been baptized, so—as Christians—they couldn’t be enslaved for life, but only as indentured servants, just like many of the English colonists, for 5-7 years. This took place more than a year before the Pilgrims landed at Plymouth Rock on the Mayflower. Upon completing their indentured servitude, these Blacks enjoyed many of the same privileges and rights as Englishmen. They owned property, land,… had access to courts: they could sue, be sued and give evidence. By 1660 the English attitude toward slavery had hardened, due to the continued need for more and cheaper labor and the increase in the Black population. This led to some of these freed Africans and their children being stripped of their land and some were placed into slavery. YOU ARE THE SUNSHINE OF MY LIFE is an instrumental version of the Stevie Wonder classic which features Clifton Anderson on trombone. A big band groove record with a bunch of first call cats,… Simply a set with no agenda other than to be the jumping off place for a great time, it’s listening jazz, it’s party jazz, it’s solid jazz. His originals stand toe to toe with Stevie Wonder covers of Wonder’s classics and there’s not a false note throughout. Get yourself in on a major find. are playing. they just played--free and easy. The Aggregation, headed by trumpeter Eddie Allen. Their new Groove's Mood CD (DBCD), has plenty of verve, soul, and swinging energy. The program has a few jazz standards, like Hubbard's "Sky Dive," a rearrangement of "Wade in the Water," two Stevie Wonder classics, and a triad of nice compositions by leader Allen. This is a tight, well rehearsed ensemble and the charts stand out as good examples of today's big band mainstream. Eddie Allen plays some nice horn too. The most ambitious number, Allen's "The Black Coming," holds the most interest for me. It is serious stuff and well played. The rest cooks, boils, and gives notice that Eddie Allen's The Aggregation is a big band to be reckoned with. The Aggregation, under the direction of Eddie Allen - Groove's Mood - DBCD DBCD 002, 77:11 ****: the jazzy big-band Aggregation's debut album, Groove's Mood, is a living, breathing, lively and feel-good outing from the opening title track to the Stevie Wonder cut that closes the program more than an hour later. Allen has joined 17 artists together to provide a toe-bobbing, head-tapping good time reminiscent of the Thad Jones/Mel Lewis Jazz Orchestra or Count Basie & His Orchestra, with excursions into blues and samba, spiritual and soul, and from upbeat swing to beautiful ballads. 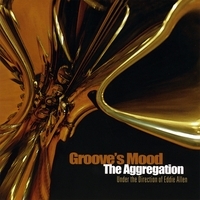 Groove's Mood conveys Eddie Allen's multiple influences and styles together in one likeable package. There are the sort of pop standards Allen has exhibited an expertise for in the past. There is the hard bop similar to what he has done with Art Blakey, the Afro-Cuban sounds he has participated in alongside Mongo Santamaria, and the arranging skills that have graced his other undertakings. The Aggregation - GROOVE'S MOOD: Under the direction of Eddie Allen, this humongous group (far too large to itemize here) will have you clickin' yer' tap shoes & snappin' yer' fingers, no doubt (whoops, really dating myself there, eh? Might as well mention "saddle shoes", yah?... ha! ha!). It's a high-talent debut that those into big-band fun will be especially proud to have in their collection... I give it a MOST HIGHLY RECOMMENDED! O's Notes: This is a large brassy ensemble under the direction of trumpeter Eddie Allen. They perform a program that includes a mix of covers and originals. Trumpeter, composer, educator and band leader Eddie Allen claims to have one goal: “To have the listener in a finger-snappin,' head bobbin,' toe-tappin,' feel good mood from beginning to end.” Groove's Mood succeeds quite well in achieving that objective. The dictionary definition to “aggregate” means, in part, “taken altogether; considered as a whole; a collective body”--referring, no doubt, to the combined talents of The Aggregation big band, seventeen unheralded players who find their groove under the direction of Eddie Allen and produce an audacious debut on Groove's Mood.